A circa 1600 Nanban trade screen of ink, color, gold, and gold leaf on paper from "Portugal, Jesuits, and Japan: Spiritual Beliefs and Earthly Goods” at Boston College’s McMullen Museum of Art. 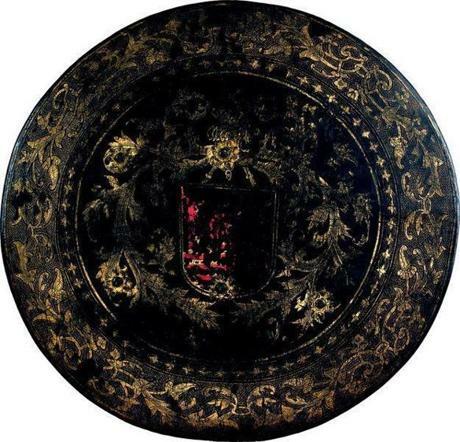 A 16th-century Mughal-style lacquered shield with gold leaf, oil paint. 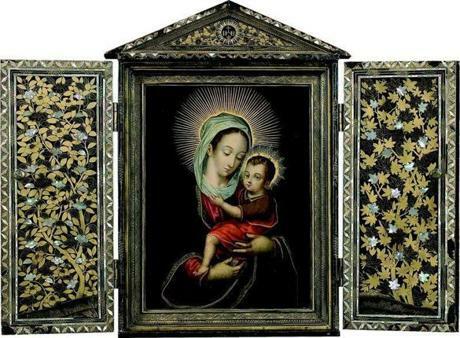 A late- 16th-, early-17th-century portable oratory with painting. Circa 1600 writing utensil box of wood with black and colored lacquer and decorated with figures of Europeans.